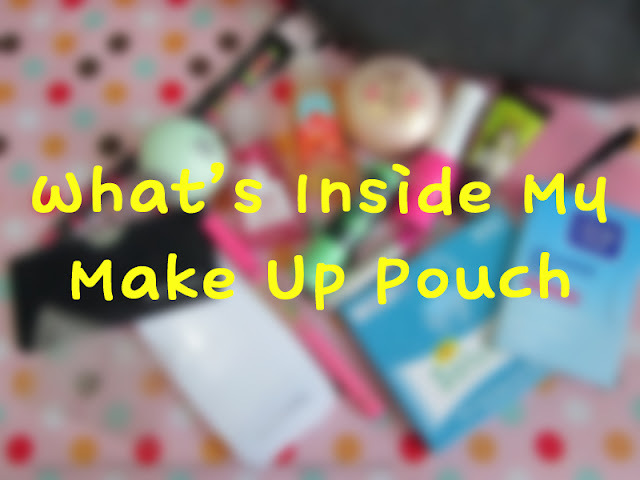 My make up pouch is from Make Over. It has a fake snake skin pattern with grey color. Another must have item~ You'll never know how many germs are on your hand, and when you need to touch something that will go into your mouth a.k.a food, and there isn't any water or bathroom, this is the best solution. I also use this as perfume *sometimes* hahaha. When I went to HK last time, I rode a taxi and the uncle driver is smelly. It will be unpolite if we spray something fragrant like perfume right? I also can't open the window because the uncle will be mad. So I use this hand sanitizer instead perfume hahaha. It helps a lot. Best solution if I need to use public toilet. The comb is quite big because I don't like small comb. I have thick hair, that's why small comb doesn't really help to make my hair tidy hahahaha. I got the mirror from my first BTI box. I have monolids. This is to create double eyelids for my eyes. My favourite lipbalm with apple flavour. The packaging is cute (similar to EOS) and makes people always ask me "what is that?" everytime I use it. wkwkwk.. I use loose powder when I'm in home. But, to bring a loose powder during travelling (or at least outside home) is a little risky. I choose this compact powder with me. It can be use wet and dry. If you want more coverage, you can wet the sponge and it will works like compact foundation. Include this in my make up pouch because the size is just perfect. Instead of bring lipstick, I always choose lip tint. Well, I'm more into natural color and somehow lip tint is easier to use when I'm in hurry. Just apply a little and blend it quickly with finger. And Voila~ a nice pink lips in a minute. Pen type liquid eyeliner is my favourite to bring. I'm very lazy when it comes to bring brush or another beauty applicator. That's why I only bring simple beauty things inside my pouch. For blush, I choose this one because it's already have its own puff hehehe. Got this from VTI box. Not really like the smell but I don't have another perfume miniature or vial, that's why I bring this with me for now. Okay, that's all my beauty products that I bring inside my make up pouch. Just realize that I bring quite many products with me, maybe this is the reason why my bag always feel heavy hahahaha. Iya ce, dikit banget isinya hahaha..